Castle in the Clouds is a historic mansion high above Lake Winnipesaukee in picturesque Moultonborough, New Hampshire. This interesting landmark is a popular tourist attraction to those visiting the Lakes Region of New Hampshire and it's surrounding towns - Wolfeboro, Center Harbor, Meredith, Ossipee, Alton and more. The grounds not only hold some of the most stunning views of Lake Winnipesaukee but also are an amazing place to explore with hiking trails, gardens, waterfalls and historic architectural features. 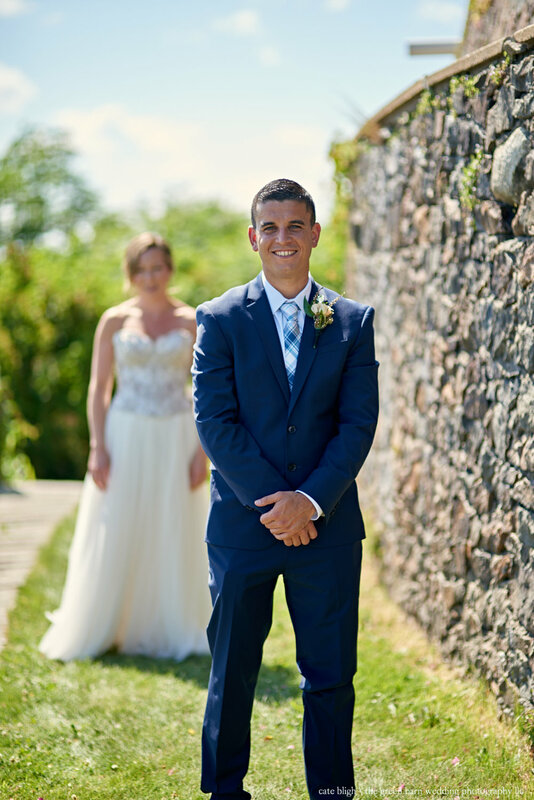 Because of all this, it is no question why Meaghan and Nick decided this gorgeous spot in New England to be the venue for their wedding ceremony and reception. The couple started their day with a first look; an opportunity to see each other before the wedding ceremony to relieve any jitters and have a quiet moment to themselves before the events of the day began. We also used this time before the ceremony to snap some family photos in front of the epic view on the lawn of the mansion. The ceremony was a short but full of emotion and memorable moments that I was lucky enough to capture. The background of the view of the lake is truly unforgettable. After the ceremony, the well preserved trolleys transported all the guests and the wedding party to the Carriage House where the cocktail hour and reception were to take place. The details at the wedding reception were all part of a simple, rustic theme that I just adored. Nothing was overdone, the details of this wedding were so well edited. Everything from the centerpieces to the wedding cake created a cohesive look that fit in the reception hall perfectly. Because of the west-facing windows that overlooked the lake, the reception hall provide the most gorgeous light through it's panoramic windows as the sun set. Light like this is incredibly rare during a wedding reception so I was ecstatic that I was able to shoot using a mix of natural light and a small fill during the important moments of the reception like the bridal party introductions, first dance and parent dances. An unforgettable view on the perfect day at Castle in Clouds in Moultonborough, New Hampshire. I would have been a fool to ignore the sunset which was incredible on this July day!